One of the most interesting trains is through the area in Northern Mexico known as the Copper Canyon. 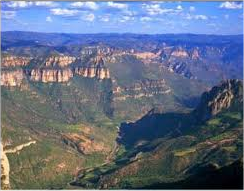 You go from El Fuerte on board the Chihuahua-al-Pacifico route into the wilds of the Sierra Madre Mountains. This canyon is 4 times the size of the Grand Canyon. It took 100 years to build this railroad that goes from sea level to almost 8,000 feet crossing some of the highest bridges in the world and 87 tunnels. You stop for the night in a beautiful hotel that hangs onto the cliff of the mountain, Barancas Divisadero. There you will meet the Terahumara Indians who live in caves in the canyon. The women wear beautiful, colorful skirts and sit outside the hotel weaving very unusual baskets. Be sure to take a big garbage bag to bring some home. The men work in mines in the bottom of the canyon where temperatures reach over 120 degrees. This is an amazing – not to be missed trip. Putting together a tour to Machu Picchu will include the Peru Rail train that goes from the gorge of the Urubamba River to Agua Caliente. The scenery is spectacular and the people warm and friendly. You share the train with some of the locals as they go about their lives. I remember seeing the majestic Andes from the train windows and pinching myself to believe I was really here. Three trains in South Africa are the Rovos Rail, The Shongolol Express, and the Blue Train. The Rovos is the most luxurious train in the world going from Cape Town to Dar Es Salaam. It carries 72 passengers in 36 superbly appointed suites. Ascend the forested Magoebaskloof with it deep gorges and ancient cliffs. Every night you will be staying in an enchating camp with local game viewing. Add onto this experience visits to Victoria Falls or include a golf safari at select golf courses in South Africa. The choices are endless. The Blue Train runs from Pretoria to Cape Town and from Tshwane to Victoria Falls. The Shongololo Express offers a rail experience throughout South Africa. Both of these are luxury accommodations and can be included with many other African experiences. Trains in Europe are very well known. Many different packages are available to cover one country or many. The timeliness and the comfort are legendary. Combine the train with a car and this will take you to all kinds of wonderful charming villages. Just pick the plan and you are on your way to adventure. 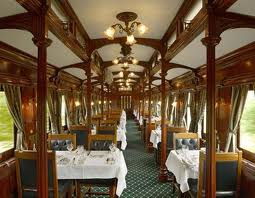 The Orient Express has a number of different trains that are nostalgic and elegant. The Northern Belle fulfills the highest expectations of the original trains of the 1930’s. Seeing Great Britain by an exclusive train in comfort and luxury. The Eastern & Oriental Express is a classic journey, linking Singapore and Bangkok. Enjoy the open end Observation car as you journey through amazing scenery, magnificent temples and palaces. Add to these unusual train journeys for Orient Express, their luxury hotels and river boats around the world. Giving you memories for a lifetime. Here is where you will find some of the fastest trains in the world. In Japan get a Japan Rail Pass and see the entire country in comfort. Even China has upgraded their trains so that you can cover long distances in a short time without waiting in airports for planes that are notoriously late.